Linfield maintain their Premiership title chase by hammering bottom side Warrenpoint Town 6-2 at Milltown. Aaron Burns and Kirk Millar each bagged doubles while Ross Gaynor and David Kee were also on target as the Blues stay five points behind leaders Crusaders. 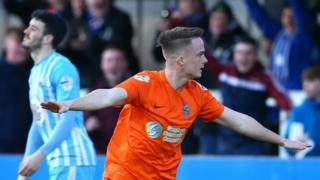 Liam Bagnall and Stephen Murray netted for Warrenpoint, who remain a point adrift of Ballinamallard United.